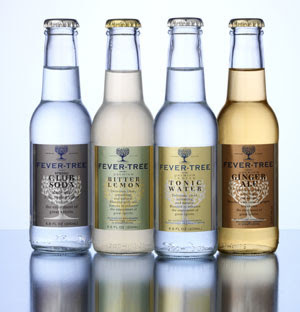 I became a fan of London-based Fever Tree mixers a year or so ago when they first entered the US market. These dandy mixers---devoid of artificial sweeteners, chlorinated water, synthetic coloring, and fake flavors---seemed to transform even the simplest cocktail. Fever-Tree appears to have filled a giant gap in the cocktail and mixer world. Despite being more expensive than traditional mixers, last year---in this economy, yet---the company grew an amazing 300%. They’ve expanded worldwide, with mixers now available in 20 countries. Indian Tonic Water is made with hand cold-pressed orange oil, coriander oil, lime oil, African marigold, Tanzanian bitter orange oil, cane sugar, and high-quality quinine from the fever-tree, long considered the finest source of natural quinine. Clean, fruity, with a hint of sweetness. Ginger Ale includes natural green ginger from Ecuador, India, and Nigeria, and botanical flavors. Lightly sweet, fresh, crisp, tangy, direct, and clean. Spring Club Soda is made with fine, soft spring water from Scotland. Dry, crisp, clean. Bitter Lemon gets its flavor from Sicilian lemon juice blended with hand cold-pressed orange oils, botanical flavors, cane sugar, spring water, and fever-tree quinine. Slightly cloudy, due to the use of real lemon juice; zesty, with a subtle quinine bite. Now a Ginger Beer has been added to the lineup. Originating in 18th century England, this beverage was wildly popular into the 20th century. It’s continued to be brewed, but not in the authentic way (requiring fermentation)---until Fever-Tree took on the task. 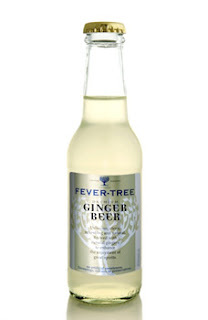 Fever-Tree Ginger Beer is brewed traditionally. A proprietary blend of three gingers is utilized (always including fresh green ginger from the Ivory Coast, and a hot, fresh Nigerian ginger). The ginger root is steeped in hot water for 48 hours; the ginger juice is drawn off and combined with spring water and pure cane sugar. I'm not sure I'd even had Ginger Beer when I sampled the Fever Tree version. All I can say is, it's simply delicious. I like drinking it by itself, but it’s a wonderful mixer as well. Here’s a recipe using Ginger Beer from the company’s website for the Dark & Stormy cocktail, which happens to be the national drink of Bermuda. You can find Fever-Tree mixers at BevMo!, Whole Foods, The Food Emporium, Wegman’s, Spec’s, and at selected retailers around the US.